It all started when a whirlwind storm descended on a normally tranquil tropical bay. By the time the tempest ran its course, rooftops were littered with watercraft, trees were adorned with windblown surfboards, and majestic Mount Mayday had even somehow managed to impale a shrimp boat. Rather than clean up, the locals said, “Surf’s up” — creating Disney’s Typhoon Lagoon® Water Park in the process! You can catch that same spirit — and a wave or two — with any number of Typhoon Lagoon’s attractions, including the biggest thrill of all: Humunga Kowabunga. Climb aboard and experience the slide of your life as you rocket 214 feet down Mount Mayday at a hair-raising 60-degree angle … including a five-story drop in the dark. Not enough slide action for you? Choose from one of three routes at Storm Slides, all of which culminate in a three-story splashdown. Or, grab a friend for Typhoon Lagoon’s unique “water coaster,” the Crush ‘n’ Gusher, where you’ll ride a raft through an abandoned fruit-processing plant via 400-foot-long tube slides. 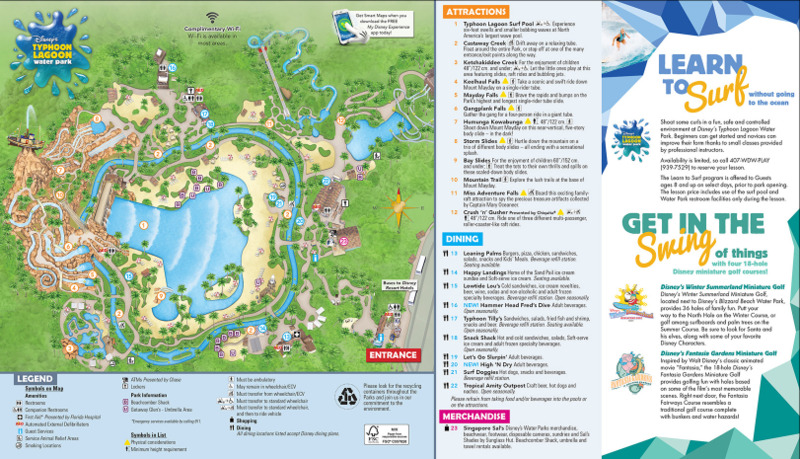 Speaking of rafts, Typhoon Lagoon features the longest raft ride at any Disney water park: Miss Adventure Falls, which can accommodate up to four guests on the world’s wildest treasure hunt. Other raft rides waiting for you here include the four-person Gangplank Falls, as well as solo rides at Mayday Falls and Keelhaul Falls. Typhoon Lagoon also provides plenty of ways to relax, including Castaway Creek, a 2,000-foot-long lazy river that winds its way around the entire park, and the beaches surrounding Typhoon Lagoon Surf Pool. And if you’re visiting with children, turn them loose at the kid-friendly Bay Slides and Ketchakiddee Creek. Ready to make a splash at Disney’s Typhoon Lagoon? Enjoy discounts on single-day and multi-day Park Hopper Plus tickets below.